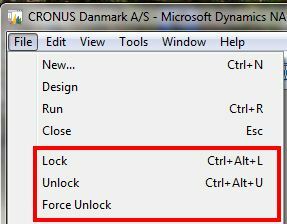 With Microsoft Dynamics NAV 2009 R2 the possibility for locking and unlocking objects was introduced and does also exist in NAV 2013. Locking and unlocking objects is very useful in environments where multiple developers are working together in the same application. If objects are not being locked – they risk overwriting changes made by another developer. Now the object is locked, which can be seen in the object designer. Here you can in the Locked By field see the name of the user who locked the object. When an object is locked, only the developer who has it locked, can change/save it. Other users can still open the object in read-only mode, compile the object and run the object. When an object is lock, no other user can lock it until the user who has originally locked it unlocks it. If the developer has complete his or hers work, he should unlock the object and thereby make it available for other developers to change it. Sometime a developer who has locked an object is unavailable – therefor it is possible to force unlock an object. Please be aware that only users with SUPER permissions can force unlock. Users do not always remember to lock objects, therefore auto locking has been made available. 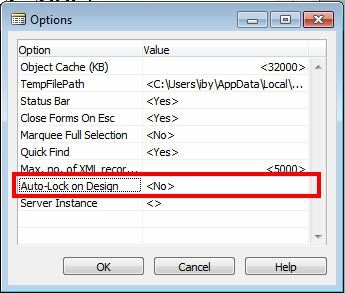 Auto Locking is activated in Tools -> Options – here the property Auto-Lock on Design can be set. When Auto-Lock on Design is set to Yes, then each time a user select Design on a object it will be locked automatically. It has its advantages but also disadvantages – users will never forget to lock an object, but they might forget to unlock objects which the have only look into and you might therefore end up with a lot of unnecessary locked object. There are no functionality for unlocking objects automatically!